You have probably heard from me and others that the US market is overvalued. You have also probably heard (from others) that since interest rates are so low, the market deserves a higher valuation. One of my favourite investment managers (GMO – Grantham, Mayo, & van Otterloo) put our a White Paper recently that you can read here. As a caveat, GMO has been wrong on the markets for several years after successfully calling the bubbles in 2000 and 2007. Time will no doubt prove them correct, but investors can be fickle. Assets were $124 billion in 2014 and are recently closer to $80 billion as many investors have closed accounts. Value managers often have this problem in momentum markets that see ridiculous valuations for long periods of time. I don’t love them for their market performance, I love them for their very thoughtful research and approach to value investing. I’ve said many times before, I’m a value biased investor. Returns in the long run are much better when you buy when value is compelling and sell when over valued. 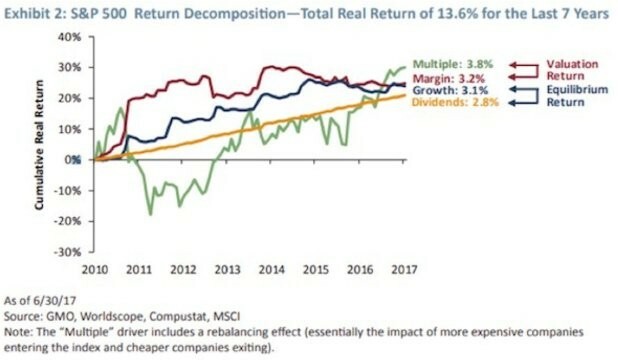 According to Montier and Kadnar, for any equity market, the return achieved can be broken down into four component parts. 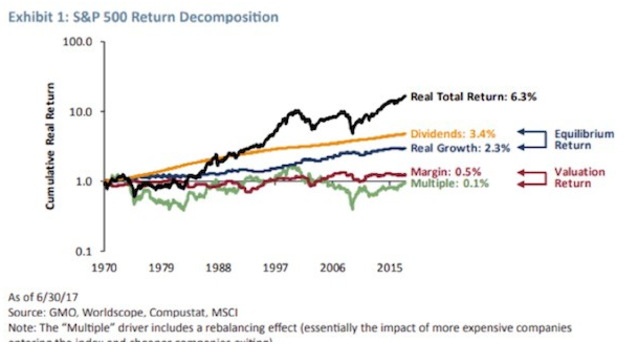 In the long term, the return is almost exclusively driven by dividends (growth and yield including share buybacks). Equity owners need to be compensated for providing capital to companies to help fund their long-term investments. That compensation comes from the cash flows the companies generate from their risky investments via earnings and dividends. The two other ways to make money from owning an equity asset class are from multiple (P/E) or margin expansion (collectively we call these elements the valuation components). Together these four components make an identity – we can (after the fact) always decompose returns into these factors. 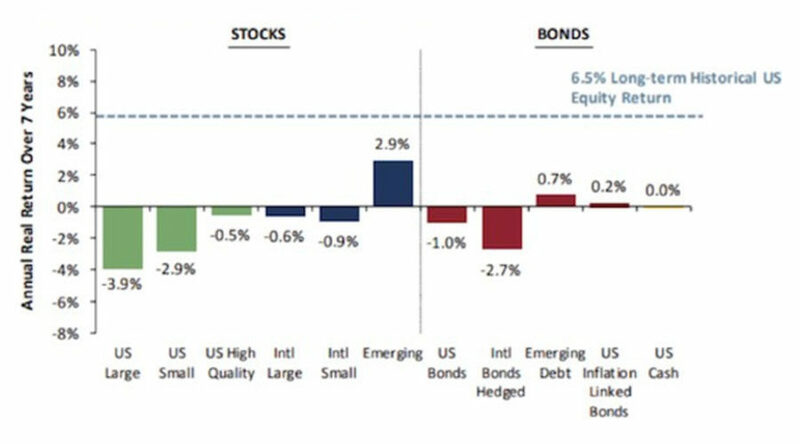 When we look closer at the last 7 years, we see that the majority of returns have come from expanding multiples and margin expansion (we think this is all about QE liquidity), two factors that in the long run will normalize at a much lower level. One argument the bulls make is that the low level of interest rates (caused by QE) demands a higher multiple. Margins improve when companies pay less to borrow. Margins have never been better for US corporations. Odds of that continuing to be the driving factor has no historical precedent. But these are not normal markets. GMO suggests that if earnings and dividends are remarkably stable (and they are), to believe that the S&P will continue delivering the wonderful returns we have experienced over the last seven years is to believe that P/Es and margins will continue to expand just as they have over the last seven years. The historical record for this assumption is quite thin, to put it kindly. It is remarkably easy to assume that the recent past should continue indefinitely but it is an extremely dangerous assumption when it comes to asset markets. Particularly expensive ones, as the S&P 500 appears to be. 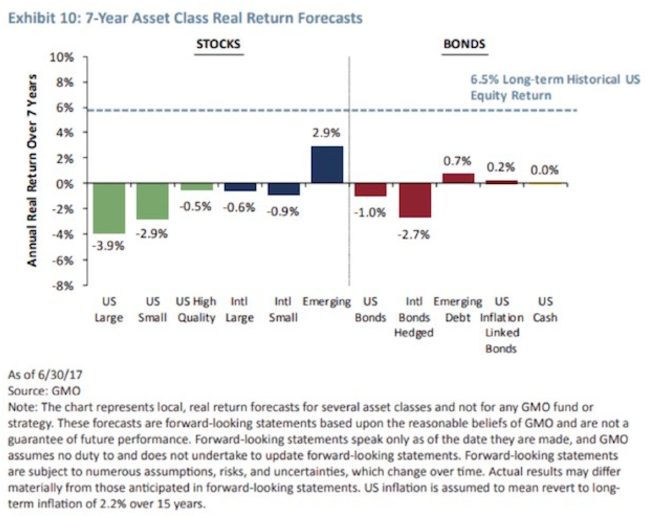 GMO takes this methodology and forecasts what returns are going to be like for the next 7-years (I don’t know why they choose 7 other than that seems to be about the average business cycle). Their forecasts are poor to say the least. But this scenario have been in place for about 2-years now. The post US election rally has made it more severe to be sure. If the US cannot deliver on tax reform and the Federal Reserve continues to remove liquidity, then factors of returns over the next few years are likely going to return to longer-term averages. Thank you for this post & for the link to the white paper from GMO which was also an excellent read. I wonder what avenues experienced value investors use for holding “dry powder.” As a complete rookie, I mostly think of high-interest savings accounts to at least stay ahead of inflation. A few smaller bank/credit unions offer 1.4% to 2.3%. Is there another or better vehicle?